We arrived in Kota Kinabalu, Sabah and went straight to our hostel to dump our bags then out for local food. This part of Malaysia had a real mix of cuisines, mostly great cheap chinese and indian food. We then tried to plan what we were doing for the next couple of weeks, after a lot of research we decided on four main loctions; mt kinabalu, sepilok, river kinabatangan and sipadan. Before we left Sabah we were so lucky to be able to go a meet up with Nova, who works in Rustic Borneo, We had first met Nova all the way back in Vietnam when we did the Sapa trek. She really helped us plan our Borneo trip. So after chatting with her, we collected our bags….a cheeky pizza hut and went to the bus stop. From about half a mile from Rustic Borneo is a bus stop with load of different shuttle buses going to a load of destinations just shout out your destination and someone will point you in the right direction. It was about 60ringit and took 3 hours to get to Mt Kinabalu. 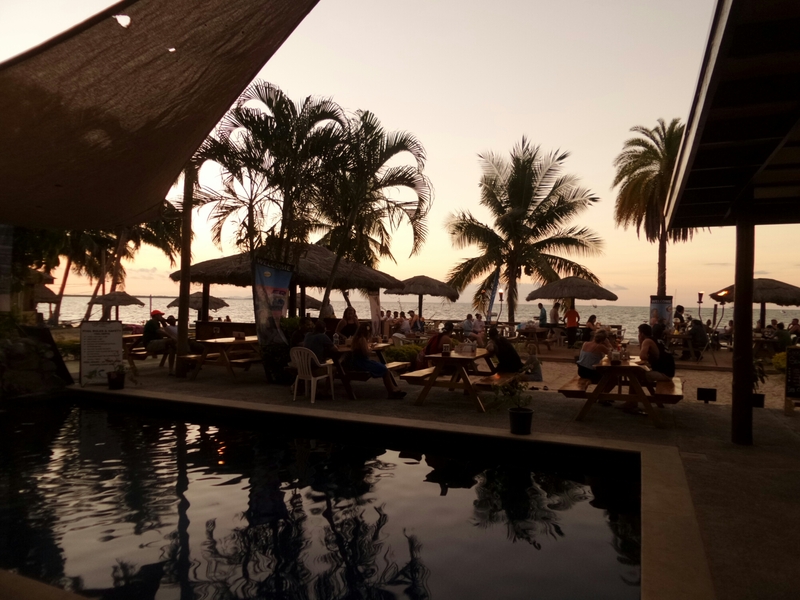 We stayed at a hostel called D’villa Rina Ria Lodge it was a very basic room with bunk beds squashed together but all you needed for a night and the views from the restaurant area were incredible. Danielle also wants me to write that the room was really cold and there were massive spiders in the bathroom….but we were in the mountains! Now we couldn’t afford to do the summit trek as its around 300GBP and you have to book it 6 months in advance but there are a load of trails in the park you can do, these were really fun rainforest treks! All along long beach are several dive shops. In fact the whole beach is just made up of either snorkelling or diving outlets. So why did we pick oh lala? A French run place needless to say, with a friendly female manager called Jan. Really nice, very straight talking and typically French. All the dive shops are pretty much the same price for PADI open water courses (1050 rm + 3%card fee), which included x3 nights accommodation in their rooms. The only exception was a place called Turtle bay divers…they’re a bit cheaper and don’t have a card fee but they don’t have any accommodation. When you work it all out though it ends up pretty much the same money wise. So the shops with the chalets just take out the hassle of wondering around looking for accommodation: unless you stay in the expensive resorts you can’t book anything before getting to the island. So we had a look at the accommodation, it’s all very basic. The main reason we went with Oh lala was that they offered us a private room rather than a dorm (for 20rm each rather than 40rm each as we were diving with them), which was nice as we were there for a few days. So we started our course in the afternoon on the 5/5/17. We were both nervous… Lara nearly backed out after having researching all the fun injuries one can sustain underwater. Eventually we both agreed to do the first session to try it and could see how we felt after that. Our instructor was a girl called Lucy from Buckinghamshire, we were very lucky she was absolutely lovely and it was just Dani and I in our group so we had lots of support! The first session incorporated skills in the shallows, with our SCUBA kit but just on our knees so we could have come up easily if needed. The hardest part was flooding our masks, at first I had no idea how to clear it and just had a tonne of salt water in my eyes. I finally understood that you can’t clear it while your still holding it off your face so got the hang of it… Dani found it a challenge too as she has a sensitive nose which kept letting in water making her choke whilst under water, not a good move. After a few struggles though we both managed to complete the skill session and then went into a proper dive, maxing at 11m deep! We saw some beautiful coral and fishies at a spot called Batu Nisan. The next day we did a tonne of theory in the morning; videos and questions and then quizzes with Lucy. Dani was a pro and got a solid 💯 on everything! In the afternoon we had a whole session of skills. So this was mainly on our knees and then some stuff a bit deeper like swimming around without a mask off at around 6m. Again Dani fearing for her life whilst trying to get her mask off, snuffing up yet more water but managing to survive and getting it second time around. The next day we finished the rest of our theory videos and quizzes with Lucy and did the final exam which we both passed woo! Then we went on a dive to D’lagoon which is not too far from long beach, still on kecil island. It was a nice dive; more coral and fishies. Then for our two bigger dives on our last day, we need to reach 18m to finish the course. The fist dive was to Tanjung basi which was a really cool dive and we saw tonnes of trigger fish and x4 black tip sharks 🦈. The afternoon dive was called Polis wreck which is an artificial wreck where they sunk x3 old police boats 🚣 to create some a new habitat where coral would grow. Here we went to 18m! We saw loads of creatures including three bright yellow box fish which we were told was very unusual for that spot. So now we are qualified PADI open water divers and can go alone (without an instructor, but with a buddy) and dive… not that we will just yet! *TIP , THERE ARE NO CASH POINTS ON THE ISLAND! So to avoid the fees get as much cash out as possible. For the first two nights we stayed at Melatis VIP female dorm, which was basic but fine. We moved on for the next two nights as we found somewhere a bit cheaper round the corner. It was v basic the guys who ran it were really nice hippies, played their guitars and drank beer with us in the evening (owner in the picture). They also have cheap mopeds to rent here. Tip for Malaysia…unless your arriving late at night and just need somewhere to head straight to, hold off booking anywhere and just head to the backpackers area. You will more often than not find something cheaper than online. So what did we do for a few days on our first Malay island. We were staying in Pentai Cenang which has a huge beach with loads of water sports. The first evening we arrived we went exploring, unfortunately the nicest bit of the beach is round a corner and privately owned by expensive resorts, but we were allowed to have a walk. In the morning we went to the Langkawi cable car which takes you right up into the clouds. The weather wasn’t great the whole time in Langkawi with big rainstorms but the views were still amazing, and it was great to get of and walk to the bridge where we were literally waking through cloud. Sadly all our photos from this day were lost on Danielle’s camera 😦 but just google Langkawi cable car and you will see the epic views from the top! That evening we walked to a local night market, there wasnt really anything good to buy but the food was great and it was here we first had these epic pancakes with sweetcorn and penuts, sounds awful but was so gooD! In the morning we had a slow day and went to a slightly different beach south of Pentai cenang. This was much nicer and quieter. 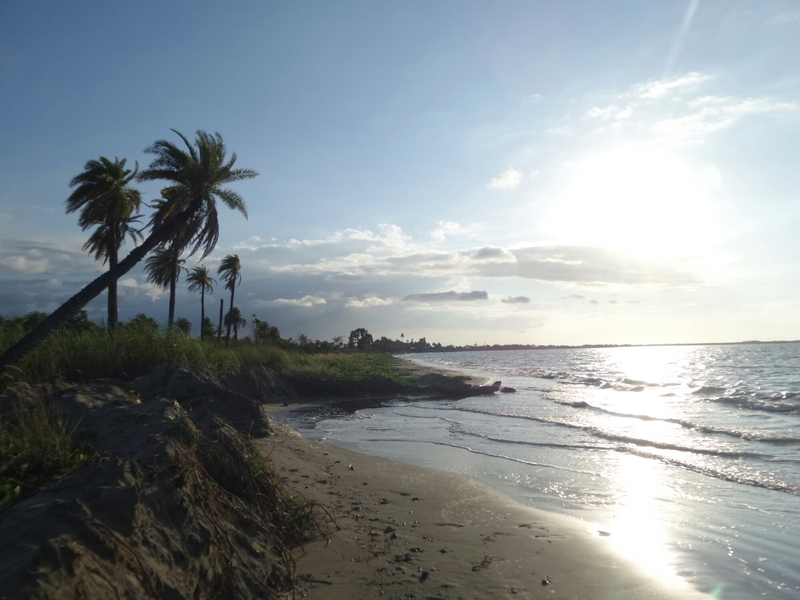 However we soon got washed out by another tropical storm! It was quite beautiful though sat in our little sun shelter watching, and getting soaked by, the hot rain. That night we went out to ‘one love’ bar with some people we met in our hostel. Make sure you drink before or take some with you as the alcohol is not great for a travellers budget! For our last day we explored the north of the island, going to pensat tongkorak beach and tanjung rhu beach. The first one is a tiny little piece of paradise, if you manage to catch it on a quiet day you’ll feel like your in heaven! When we went it wasn’t too busy but there was one couple enjoying themselves a little too much and it was putting everyone right off!! We were very relieved when they disappeared. The next beach is much bigger and half of it is private, but the views of big ocean space and white sand were lovely to end our little trip to langkawi! After our nice stressful bus journey from Vietnam we arrived pretty late to Phnom phen so went straight to sleep at the hostel. When you arrive in Cambodia make sure you have dollars, as unlike Vietnam, you have to pay for the hostel upfront. We stayed at Billabong hostel which had a great pool, and location was fine. Dorm was nice and big with a huge en suite and big singles. Great nights sleep! Next day we went to the killing fields about half an hour away, it was $6 entry and audio tour. I would definitely say to get the audio tour, it was so informative. We didn’t know much about the genocide so was good way to learn. So, so sad but worth the visit. In the afternoon we went to the Palace but didn’t actually go in as it was $10 but it’s a really nice area to walk around the outside and you still get some good views. That was about it for us in the capital city. So the next day we booked the bus to go to Siem Reap; $10. We stayed in Siem Reap Pub Hostel which was a nice little hostel with a decent pool, really good location right next to pub street and the night markets. Also right next door was a good place for food, it was cheap and the owner was lovely. The shop after was the cheapest in the area for laundry at $1 per kilo. The main thing to do in Siem Reap is obviously Angkor Wat temples. There are 1000 altogether! There’s a couple different options for tickets, we just got the day one which was $37 (they have recently just doubled the ticket price and no one could answer why…one lady told us it’s owned by the Vietnamese Government (not sure how true this is or how that works). Anyway it’s still worth this crazy western price, you’re probably only there once in your life! The day was absolutely plenty for us, but if you’re a temple fanatic look into the 3 day or 1 week tickets as they become a lot cheaper per day if you do this. So we woke up at 4am to catch the sun rise over the main temple; Angkor wat. This was really stunning, just try and ignore the thousands of other people! Also when you are walking in, looking directly at the temple we went to the left as that’s what someone advised, however, we would recommend going to the right, we feel you get a slightly better view. We then spent the day exploring the hundreds of other temples and came back to the moat around Angkor wat to watch the sun set. Wondering around the temples…make sure your feeling fit! In the evening we had a walk around the night markets. They are great and a fantastic place to buy cultural gifts. Bartering is a challenge to get on with at times and being very British it makes you squirm a bit. We’d recommend to start at just less than 1/2 of what they ask. The ones that thrive off ripping off their customers will wave you off, however the realistic ones will slowly come down. It’s probably best to aim for just over 1/2 to 3/5 of their original price. We arrived in Nadi airport on the 14th Nov after leaving LA on 12th. The 13th got lost in Bermuda, feeling sorry for everyone born on 29th February. * Buy your currency outside of the airport. Most hostels/ hotels/ etc., will have a better exchange rate. Or just outside of customs. * BUY YOUR ALCOHOL AT THE AIRPORT – preferably before you arrive in Fiji. You can however buy Bounty (58% volume) dark rum from the liquor part of the superstore, about $35 fjd (~£14) for a small shoulder. We were missed from the pickup at 630am so had to wait for another car. We didn’t mind too much, just sat and slept a little more in the airport. They got us to the hostel in Fiji time, only stopping twice to have a 10 minute phone conversation and again to go to the shop… FIJI TIME, something you will become very familiar with. NOTE* it appears that a lot of the dorms all over Fiji suffer with bed bugs so be prepared. The views were fantastic and water like a 50 degree bath. Walking down the beach we found these amazing clams; when the wave retreated, 100’s were left exposed half way up the beach. It was fantastic to see them burying into the wet sand. 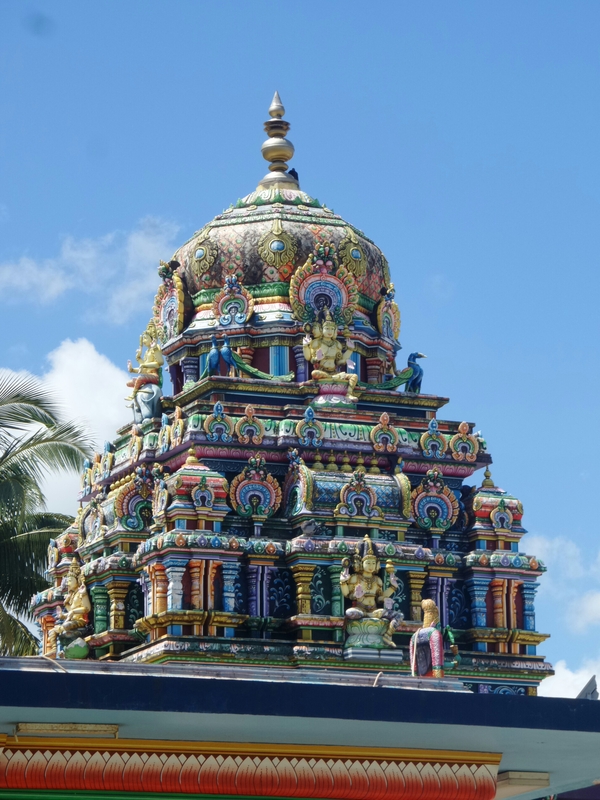 The next day we took a trip to Nadi town in a taxi which cost $10 fjd (~£5) one way. Booked by the hotel, it’s probably much cheaper to get a street taxi if at all possible. We took the bus home which was $1 each – bargain. Quick ride, you see lots of scenery and get to ride on the beach. 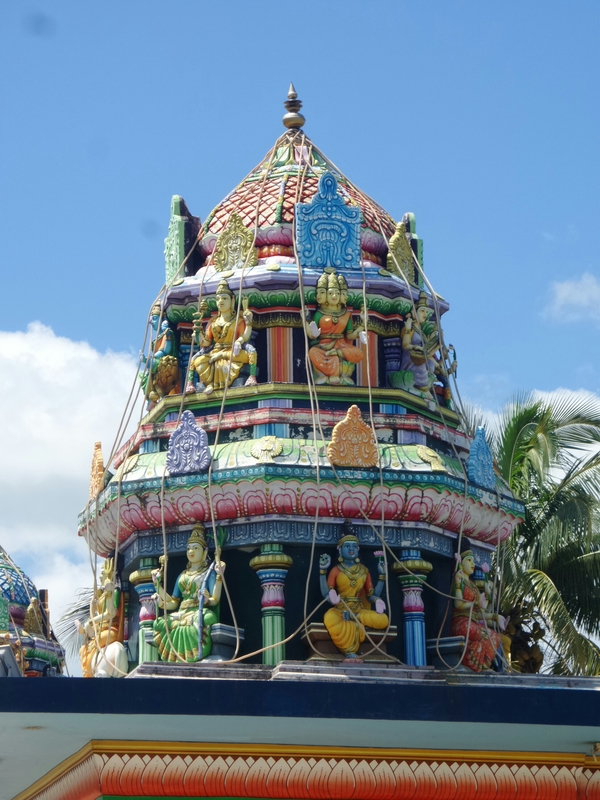 Nadi was a great experience, lots of shops, local people and food. * Don’t stop to shake hands and talk to everyone. They will try and take you into their shop to drink Kava and buy expensive things. Be friendly but not overly inviting. Wear sunglasses. We went to the little curry shop recommend by lonely planet; enough for two to share for a light lunch. 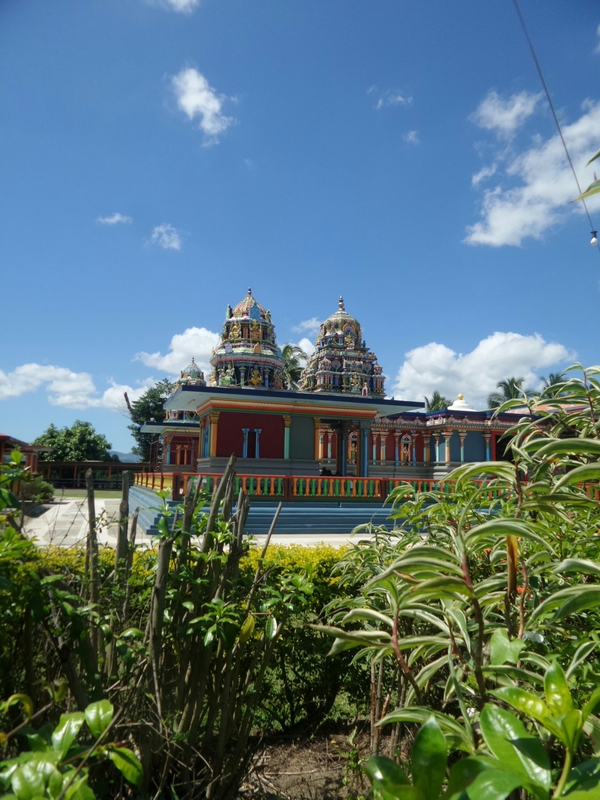 Spotted the beautiful Hindu temple at the very end of the road. We scoured the streets for the locals market where you can find great fresh fruit and vegetables and then drank street water from a street tap (we didn’t die which is a bonus). We did manage to find a couple of cheap supermarkets in front of the bus station where you can get most foods, snacks and alcohol from. Getting on the cheap bus home was a great local experience… they drop you back at your door for 1/10 of the cost of the taxis. Near smugglers cove there is a supermarket that is reasonably priced. Alcohol is very reasonable here also, we’d recommend black heart rum premix (7%) or Woodstock bourbon premix (8%). Lastly there is an Asian restaurant called Grace Road. It’s cheap and absolutely amazing healthy food. You get free rice refills and is BYOB. The main attraction in Fiji, in our opinion, is heading out to the islands. 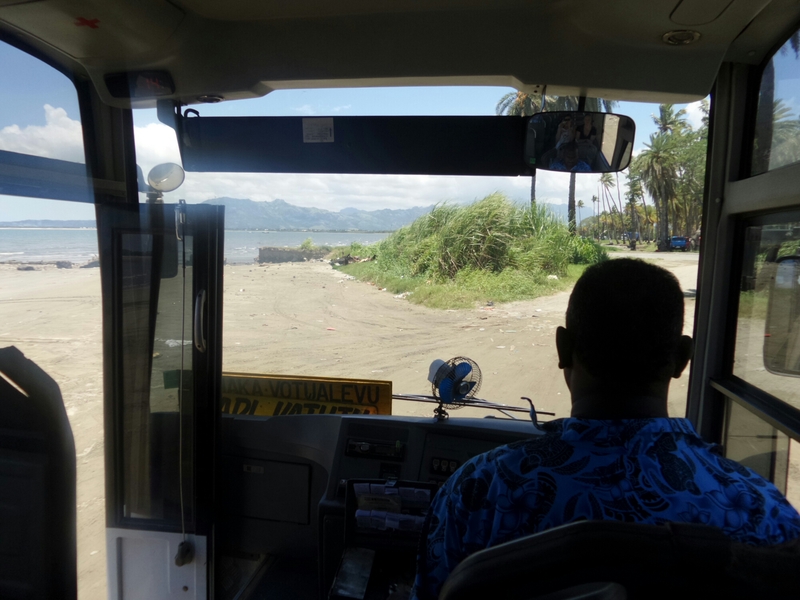 There’s a free shuttle provided from just outside the hostels to port denarau where all the ferrys to the islands go from. This leaves at 0715 arriving at the port around 0750. *Tip: book your ferry pass before you go, unless you know exactly which island resorts you want to do. The accommodation can easily be sorted out on the boat but all depends on availability. We would recommend 4-6 nights on islands altogether, it’s quite feasible to do most islands in one night. Anymore than this and you start running out of money/sun-cream/excitement for snorkeling and the sound of drums before your allowed to eat. This sounds like madness…how could you get bored on an island, but its so hot that you cant spend that much time in the sun! Each island resort is all inclusive, fussy/delicate eaters be warned! There is no choice, start training your immune system now. *Tip: take plenty of suncream and hand wash/sanitiser. Wailealea: lovely dorm room with mosquito nets, good food portion sizes and really friendly staff. Massive thumbs up! Our favorite resort. Great activities: snorkeling with reef sharks, guided hike, kayaking. If you’re on the activities pack you’re allowed to pick two. Activities:coral reef snorkeling ( you only get one at this resort). *Tip : Korovu is another resort just next door: much nicer, cleaner, has a pool!! And they are taking 1 coconut but for some reason awesome adventures don’t advertise and the resort really want more people so if you get given white sandy, request Korovu instead! Nabua Lodge: really picturesque island with perfect white sand and crystal clear water. Sadly the resort didn’t live up to the island. Really small portion sizes and very average food. Staff were miserable and seemed annoyed to have anyone staying with them. Activities: blue lagoon snorkeling, cave trip, village trip, massage (you get to choose two). Mantaray: we booked this as an extra night, not included in our pass as we had been recommended by people back in the UK. Really fantastic resort, can immediately see the difference from the family/locally run resorts and the commercial ones. Would recommend this resort for those on holiday, not necessarily travellers as the activities are more expensive and it’s harder to meet people as its so big. It was great fun though and we were there with a few people we had met on the islands before. There were great clean dorms although really far from toilets, good food with a big menu choice which we hadn’t encountered before. Acrivites: we didn’t do any here as we were not on the package and run out of money but we heard the sunset cruise was really good but the snorkelling nothing special. *Tip: ask other travellers for advice what to do / where to stay. Get involved with and speak to the locals on the islands! Also each island has their own version of the BULA dance 🙂 so try and get to know each one. The best part of island life really was getting to know the locals who lived there and all the other traveler’s. You have every meal altogether so its nice to sit and chat, we met so many great people and got some great tips for the rest of our trip.